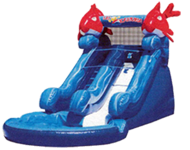 Tooney-Looney Rentals LLC is family owned and operated out of Skowhegan, Maine and are fully insured. 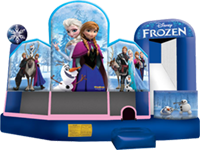 We offer bounce houses, waterslides, dunk tanks etc. These items are great for birthday parties, family gatherings, company picnics or just for fun and where we have a variety of items we'll make your special occasion much more fun. We are open seven days a week from 8:00 am to 6:00 pm. 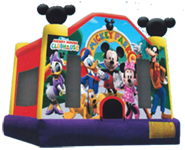 We cover most areas where we deliver, setup and pickup the bouncy houses and games. If you reside more than 20 miles away from Skowhegan, call for a quote. 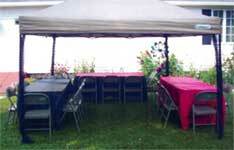 Call (207) 858-0811 or Email now to reserve any of these items for your special function. Don't forget winters can be jumping fun too. 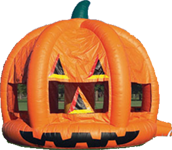 We deliver year round - school gyms, churches, community centers, etc. Give us a call for your reservation. Safety trained staff is available and highly recommended for large events. All school and town functions must have a trained attendant. Call for details. Site content & graphics © Looney-Tooney Rentals unless otherwise noted. All Rights Reserved.